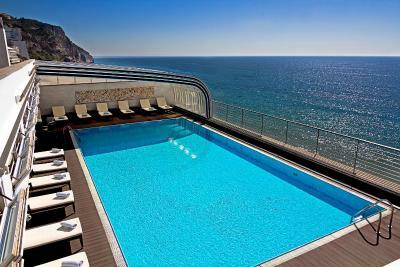 Lock in a great price for SANA Sesimbra Hotel – rated 8.7 by recent guests! The swimming pool and the bed!!!! Wee slept so well! 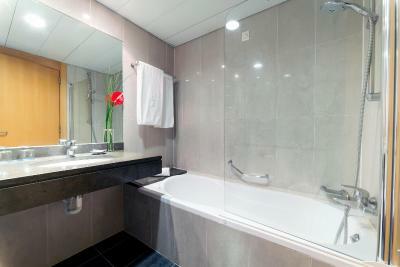 Great location, very modern and comfortable hotel. excellent breakfast , restaurant food good. Very friendly staff ! High recommended! Beach directly there, great view from room, relaxed rooftop pool, chill music on rooftop, great restaurant, friendly staff. We loved it. 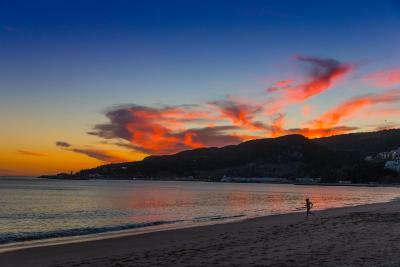 The service was awesome and the town of Sesimbra was amazing all around. Very clean and comfortable room. Pool with ocean view. Friendly staff. Good breakfast. Very pleasant stay. Breakfast is amazing, hotel is great! Pool is nice! Beach right across street. Room comfortable and clean. 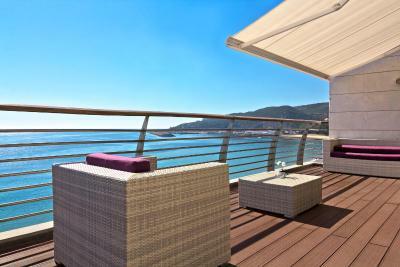 SANA Sesimbra Hotel This rating is a reflection of how the property compares to the industry standard when it comes to price, facilities and services available. It's based on a self-evaluation by the property. Use this rating to help choose your stay! 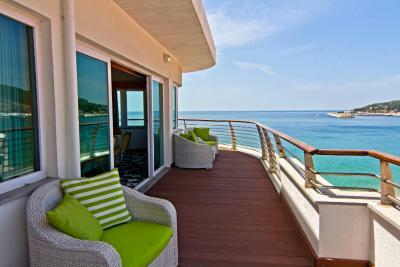 Most rooms have balconies and boast a picturesque view overlooking the beach. 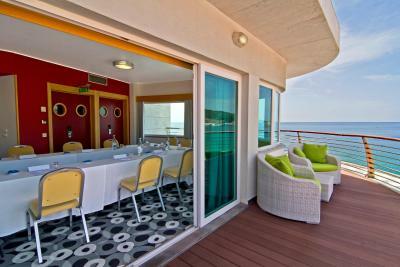 The spacious accommodations of SANA Sesimbra Hotel is decorated in mellow colors and chic furniture with a modern touch. 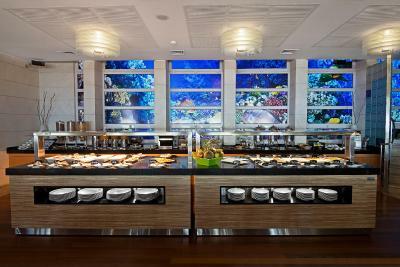 A buffet breakfast is served every morning at the hotel. 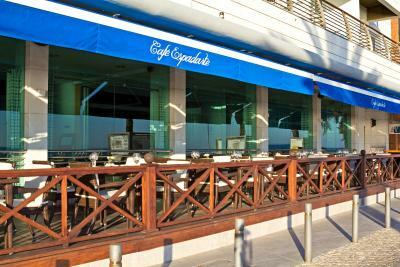 The Espadarte Restaurant serves tasty Portuguese-style meals, with an emphasis on fresh fish and seafood specialties. With a panoramic view over the bay and a relaxing ambiance, the rooftop Caravela Bar allows guests to unwind with a drink while enjoying the sunset. 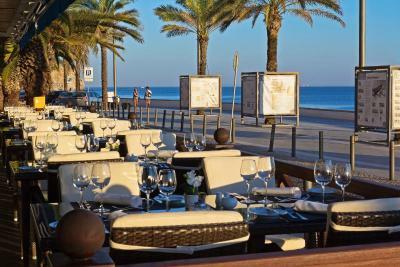 The seafront promenade features several cafés and quaint little shops. 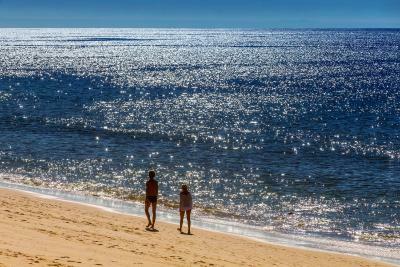 SANA Sesimbra is only a short drive away from a number of renowned golf courses in the surrounding area. The historical city center is a 5-minute walk away. The famed Galapinhos Beach is at 12 mi. 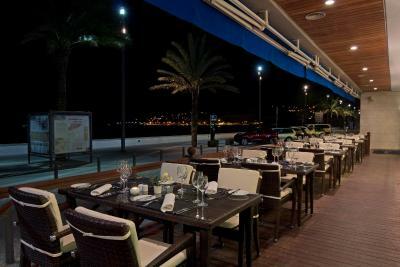 The SANA Sesimbra Hotel is at a 50-minute drive from Lisbon's Humberto Delgado International Airport. 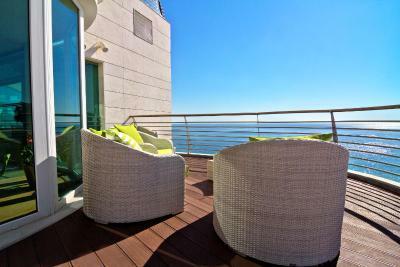 This is our guests' favorite part of Sesimbra, according to independent reviews. 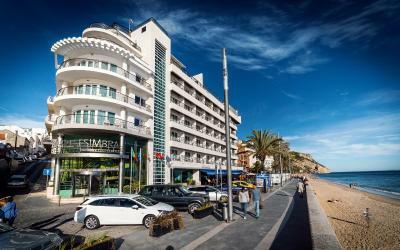 When would you like to stay at SANA Sesimbra Hotel? 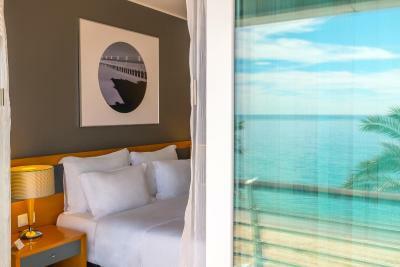 Elegant room with modern furnishings featuring ocean views. 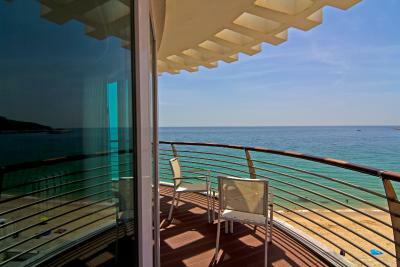 Rooms with balcony will be assigned upon check-in and are subject to availability. Please note that the bed type will be assigned on arrival upon availability. - Free parking (subject to availability). 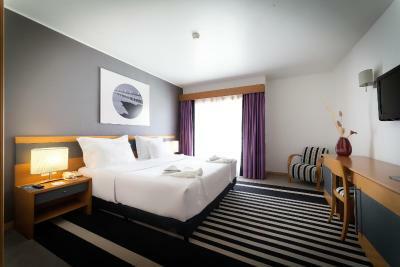 Elegant room with modern furniture, and an LCD TV with cable channels. The maximum capacity for this room type is 2 adults and 1 child. 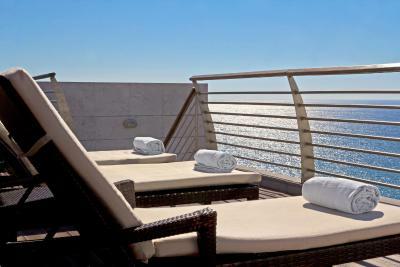 This air-conditioned suite features a spacious balcony overlooking the sea and has two separate areas: bedroom and living room. 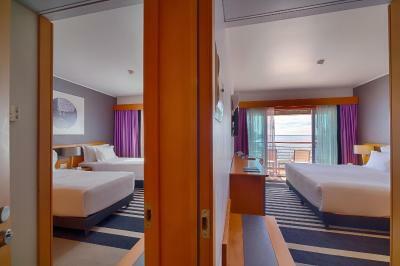 Please note that this room type can accommodate up to 2 adults and 3 children until 8 years old. Extra beds for children between 4 and 8 years old are subject to an extra fee, which is variable according to seasonality. Please contact the hotel is you wish to add an extra bed to your booking (subject to availability). 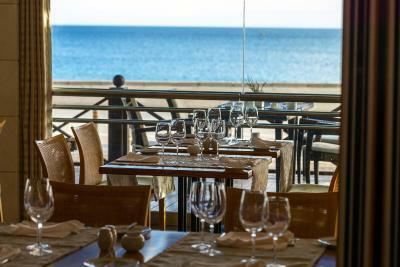 This Summer offer includes a buffet breakfast and dinner at Espadarte Restaurant (drinks are included). 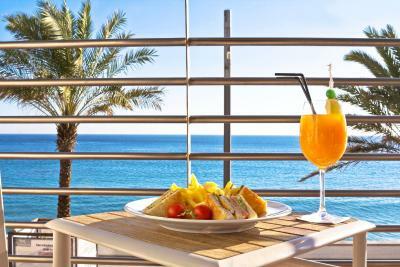 This Summer Offer includes buffet breakfast and dinner at Espadarte Restaurant (drinks are included). This twin/double room has a soundproofing, flat-screen TV and mini-bar. - Parking (subject to availability). 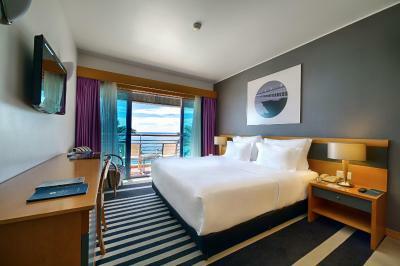 SANA Hotels offer deluxe hotels, centrally located, with its own distinct flair and personality. 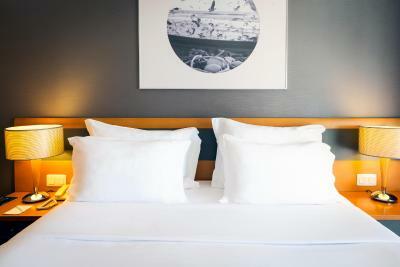 Comfortable rooms, exquisite décor, exceptional breakfasts and service oriented staff are features of this customer-friendly collection of unique hotels. 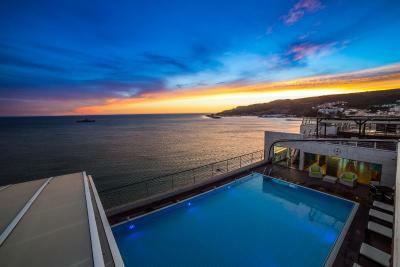 House Rules SANA Sesimbra Hotel takes special requests – add in the next step! 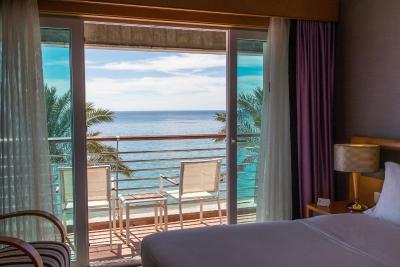 SANA Sesimbra Hotel accepts these cards and reserves the right to temporarily hold an amount prior to arrival. Please note that the hotel's private parking only has 39 spaces (35 interior and 4 exterior) assigned upon availability on arrival. Private parking has an extra cost of EUR 12 per day. There is public parking on the streets around the hotel, and a large public parking nearby. Please contact the hotel for more information. Please note that the swimming pool is open from 09:00 till 20:30 daily and that it can be made an open-air pool or an indoor pool, depending on the weather conditions. Please note that the maximum number of children permitted in a room is 1. One child from 0 to 3 years stays free of charge in a child's cot/crib (upon availability). Extra beds for children between 4 and 8 years old are subject to an extra fee, which is variable according to seasonality. Should the guest staying at the hotel not be the same person as the cardholder, the guest must send to the hotel a written authorization signed by the cardholder, authorizing the hotel to charge the card, with a copy of the credit card and copy of the passport or identity card. 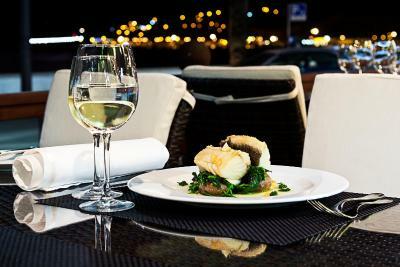 Please note that guests must present the credit card used to make the reservation on arrival. If you are not the owner of the credit card used to make the reservation, you must provide another credit card or use another method of payment. Please also note that the property will send guests a secure UNICRE link, to proceed with VISA or Mastercard payments. Great location, comfortable bed and good breakfast with quality coffee. The matress of the extra bed was terrible. Too hard! 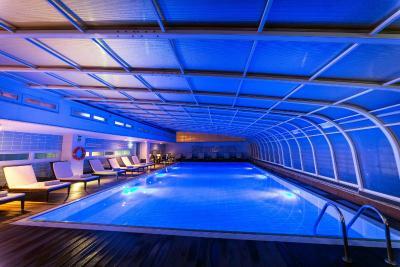 The indoor swimming pool, the breakfast. On site parking very small and hard to maneuver. Very friendly and helpful staff. Very very very good breakfast. Small lack of attention to details as no bottle opener on mini bar, no plastic cups to drink water close to the sauna area. 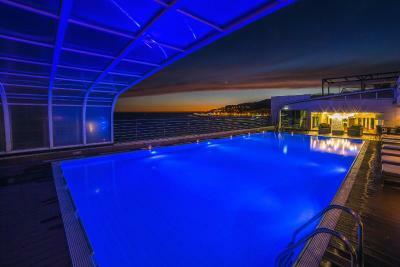 The seaview rooms are a must and roof top pool is also very nice. They had a variety of breakfast which was excellent. The big bathroom with a sea view just topped it up for us. The area was quiet as it was out of the season. 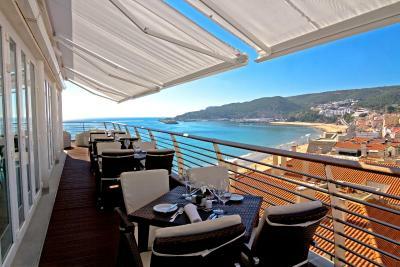 I definitely recommend it for the stay in Sesimbra! Perfect location with friendly staff. 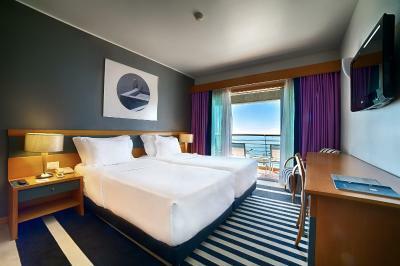 Nice room with comfortable bed. Good breakfast.